​Yardstick Golf recently completed an extensive survey of golf center owners across the United States seeking to understand key business trends, strategies and drivers of profitability. We combined the survey data with information on things such as local golfers, weather and average daily traffic to gain a deeper understanding of what drives success for indoor golf centers. Indoor golf facilities participating in the survey were a combination of “pure” indoor golf centers and “combination” facilities. “Pure” indoor golf centers generally offer simulator golf as the only golfing option. “Combination” centers offer both simulated and outdoor golf options. A vast majority of the survey participants own a single location under their own brand (I.e. very little franchise activity). The study provides key information such as which criteria were most important for center owners in choosing a golf simulator. It also provides analysis on expected golf center visits by month and customer visit frequency based on key drivers such as golfers in a 10 mile radius. We also provide a breakdown of what percent of revenue comes from simulator use, food, beverage, lessons, merchandise and events. Find out how facility owners evaluate the effectiveness of various off season approaches to driving traffic. GET OUR BEST PRICE EVER! Clicking "Buy Now" takes you to PayPal. Once you enter your payment information, you'll be directed back to this site to download your material. You will need to click "Return to Merchant" after the receipt page if you pay by credit card to begin your download. My Guarantee: If, for any reason, you’re not 100% satisfied with my business idea analysis, I’ll refund your money one hundred percent! There are currently over 100 commercial indoor golf centers in the United States. Nearly all of these are located in the northern half of the US. 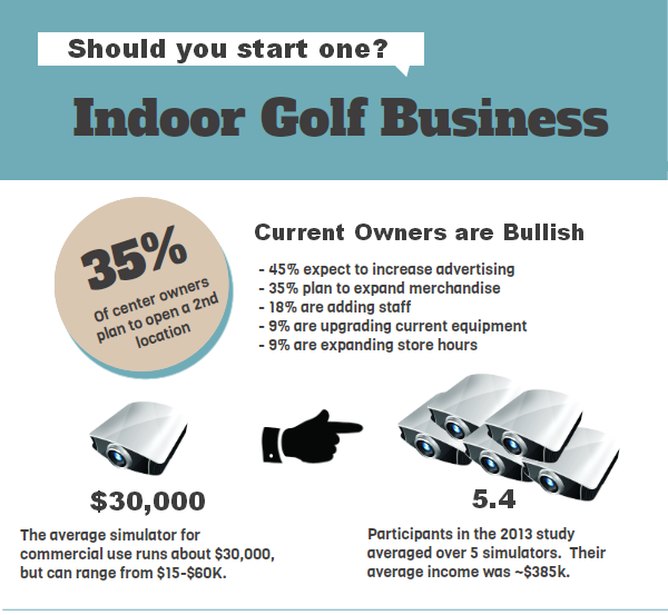 We surveyed indoor golf centers about factors driving simulator choices, visitor volumes by month, frequency of golfer visit, composition of revenue and future plans. Surveys were completed by just under 20% of the indoor golf centers noted above and should be representative of the industry as a whole. The model takes all of the information learned in the study and puts it into a simple to use Excel-based business model. It allows you to project profits and losses based on real business averages learned in the study. The model includes information to help you determine the right number of simulators for your center based on home ownership, number of golfers in the area and weather. It also includes a 3 year summary financial projection based on the input you provide along with detailed monthly forecasts for years 1 through three on separate tabs. 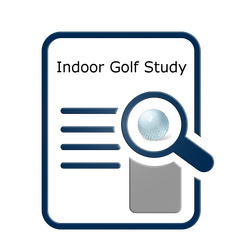 Each is formatted and ready to print to make it easy to use with your bank, investors or business plans. Want to own a golf business? Of course you do. But how? Running an indoor golf simulator is one way to get into golf that many are trying and we’ve got the data to tell you how they are doing. If you’re reading this it’s because you would like to own a golf business. It’s been a desire floating around in your head for who knows how long. You’ve searched and reviewed and are ready to take action. What if there was a way to demystify this new golf business and model how well it would do in your town. 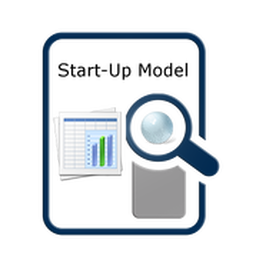 What if it cost you less than a few rounds of golf to get the facts along with an Excel model that could help you evaluate your assumptions and test profitability? Wouldn’t you give it a shot. After all, you wouldn’t have major surgery without first talking to another doctor, would you? So why would you start a new business without first reviewing how folks in the business are doing today? In business second opinions are often quite expensive, especially when it comes to testing new concepts. This is why franchises are so popular, they appear to take all the risk out of a decision by handing you a proven model. But that model comes at a high cost. They can run you anywhere from $1,000 to $100,000. That is a lot of cash. Yardstick Golf can help! We’re here today to offer you something different. Something simpler. Something much cheaper. You need a basic business plan, facts on how others are doing and a way to evaluate the opportunity in your home town. We have all of that, for less than a few rounds of golf. What You’ll Get Yardstick Golf recently completed an extensive survey of golf center owners across the United States seeking to understand key business trends, strategies and drivers of profitability. We combined the survey data with information on things such as local golfers, weather and average daily traffic to gain a deeper understanding of what drives success for indoor golf centers. To keep prices low, we run a pretty lean service. Once you place an order via PayPal, we’ll send you both materials within 2 business days. Act now, because the normal price for this service is almost $450, but for a limited time only, you can take advantage of this new service for only $39.